Winter pasture where resilience-based rangeland monitoring training took place. Four vehicles, two large passenger vans and two rugged looking SUVs transported us to the field training site. The SUVs were equipped with snorkel exhaust systems and their chassis were lifted an extra six inches off the ground, a common site on the unpredictable countryside roads of Mongolia. We stepped out onto the sparsely vegetated grassland. There were about 25 of us all together. The pasture we stood on sloped down to the left until it met the other hillside in a triangular fashion, creating the obvious watershed for the area. One might expect the tan ground to gradually shift to a faded green and even include bright green plants near the drainage, but the harsh winter and dry first month of the growing season had insured the dull collage of light browns would dominate the landscape. Small disturbances from burrowers littered the ground in front of us, offering their soil aeration services for free. One hundred meters from where we stood were remnants of a small permanent shack, surrounded by crude wooden enclosures. The permanence of this structure instantly seemed out of place. 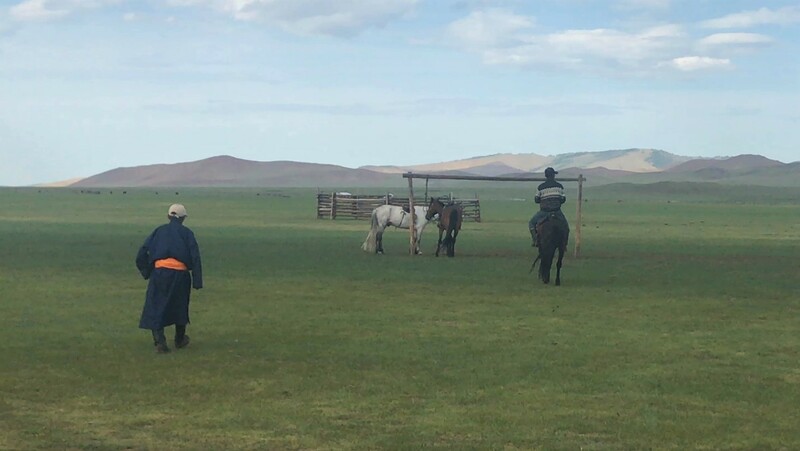 Already, I had become accustomed to the mobility and transience of the settlements in the Mongolian countryside. 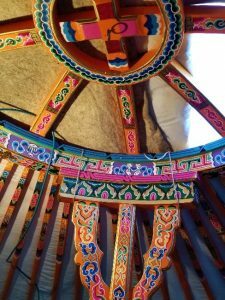 The preferred living quarters are round portable dwellings called gers, which families pack up and move two to six times a year. Not only are gers preferred, they are essential to the nomadic, herder lifestyle the Mongolian landscape and unpredictable climate demands. These sacred gers are usually comprised of five to nine wall panels, attached by a series of beautifully painted slats to a wooden ring held up by two central pillars that forms the peak of the ceiling. Traditional Mongolian gir. (a) The hand-painted structure of the gir from the inside. 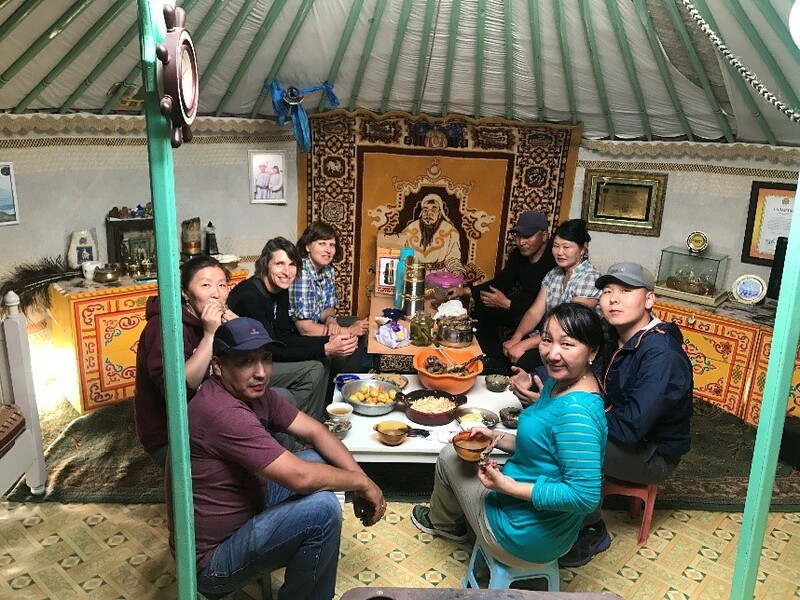 (b) Lunch with herders inside their ger. Herders nomadic settlement at summer pasture. Hand woven wool felt insulates the floor and walls of the dwelling while the outermost layer is comprised of a handmade, water proof canvas. Upon entering the south facing door, the consecrated stove, essential for survival through the winter, is positioned centrally between the two pillars. The right side of the ger is the families’ personal living area, while the left side is always prepared to accommodate guests, representative of the comradery and hospitality Mongolians willingly share. 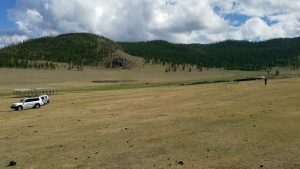 However, this permanent structure was evidence of a winter camp, where a family would spend the harshest months of the year, letting their herds graze on the tall foliage that made its way through the persistent layer of snow. Sadly, the traditional practice of traveling between different pastures with each season is changing. This is a result of many factors. Mongolia has been more heavily impacted by climate change than many other parts of the world. Their average annual temperature has risen more than twice as much as the global average in the past twenty years. This, along with more extreme winters and more frequent droughts has decreased the productivity of the rangeland, meaning less food and skinnier livestock. On top of this, livestock numbers are at an all-time high, exceeding projected carrying capacity in many areas three times over. 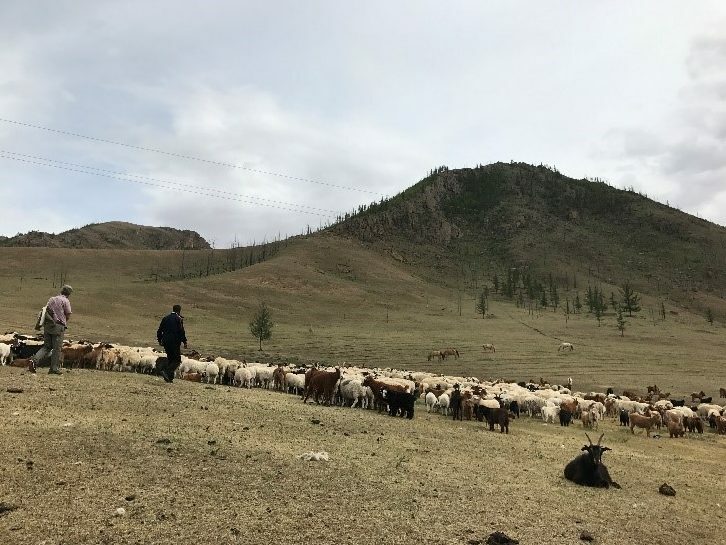 Herders own larger herds to increase their livelihood and produce as much meat as they once did when the condition of the range and their animals were better. This has created a vicious cycle in which the market is completely saturated at the end of the grazing season and herders are getting a fraction of the price per kilo they once did. The rangeland is left overgrazed and degraded in places. If something is not done soon, these areas could pass the point of no return and open the door to invasive species, erosion, habitat loss, and possibly desertification of these once rich pastures. 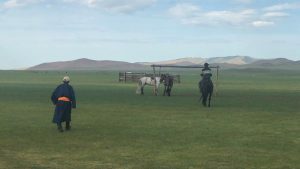 On this day, the 25 people that speckled the landscape were not wearing brightly colored, one-piece deels, high leather, pointed toe boots and sleek brimmed hats indicative of Mongolian herders. They were not intently watching their herds of sheep, goat, yak, cows and horses. Instead, on this day, the winter pasture was full of local government officials and natural resource professionals that were participating in the resilience-based rangeland monitoring and management training. Their modern suits, some complete with neck ties and matching pocket squares, seemed out of place against the rural backdrop. Despite their urban appearance, these participants all had years of experience on the range and understood better than most the exigency of the situation. My experience this day varied slightly from others, as I viewed most of the day’s events on the 2 by 5-inch screen of my phone, or the slightly smaller screen of a borrowed camera. My ears were plugged into a hand-held recording device, to insure the audio was of high enough quality. This was a new experience for me. I rarely take pictures or videos of my activities, but I was honored to be given this task as it was imperative to sharing this valuable information with others. My lack of experience and equipment presented some interesting challenges. 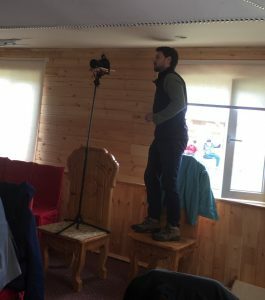 While filming presentations earlier in the day, after realizing it was unrealistic to hold a camera in my hands for five hours, we scavenged the tourist camp where we held the indoor portion of the training for anything that could be useful. Our solution came in the form of a microphone stand precariously positioned on top of a chair, with a book strapped to the top of the stand to create a flat surface for the camera to sit on. It was surprisingly effective. When filming outside, the biggest challenge was the wind. My head constantly swirled with chatter from the hand-held recorder. 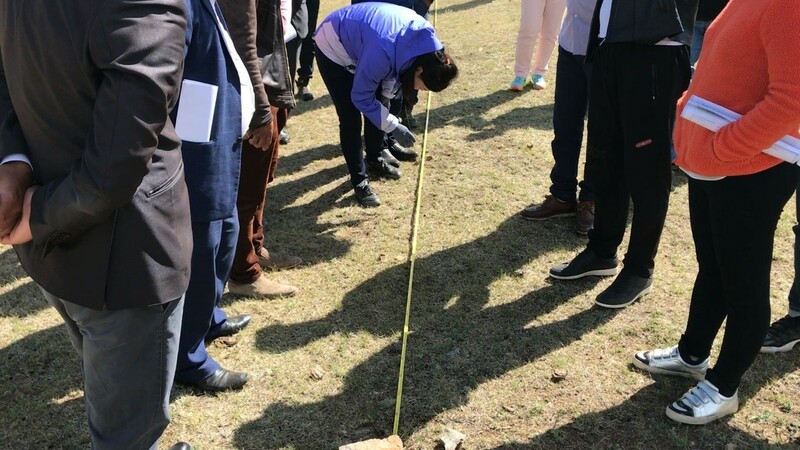 Dr. Bulgamaa Densambuu and her research assistant Sumjidmaa Sainnemekh gazed down at the ground, taking a quick glance at the species composition before they started the resilience monitoring training. The purpose of this training was to provide these communities with a scientific process in determining the current state of pastures they wish to graze This is accomplished by assessing the plant composition and dominant species of the rangeland. Herders can then compare their findings to a series of reference states. For example, if Stipa baicalensis is dominant then the rangeland is in a healthy enough state to be grazed. If species’ such as Carex duriuscula or Artemisia spp. are found to dominate then the pasture should be left to rest until species indicative of a healthy composition return. The training was very well received. Feed-back from the trainees indicated they were exploring ways to incorporate the scientific monitoring into management strategies and justifying future policy change. 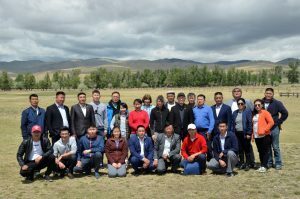 More than anything, the government officials and natural resource managers wanted this training to be available directly to herders. It is important to note that this training was meant to enhance the livelihoods of countryside pasture users by ensuring a lucrative future for their trade, and in no way take away from their practice. I feel a large challenge going into the future is to use modern technologies and techniques to enhance people’s way of life instead of altering them to fit a global, monocultural model. To me, the beauty in the world lies in its diversity. Upon starting this project, we developed a mission statement to help focus our efforts. 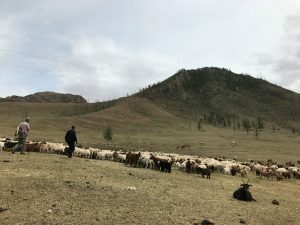 Our mission is to improve knowledge and practice of resilience-based, rangeland monitoring and management in Mongolia, and to increase understanding of Mongolian rangelands’ responses to environmental change toward preserving their ecological health and insuring the livelihoods of current and future pastoralists. The most important thing about this mission statement is its malleability. 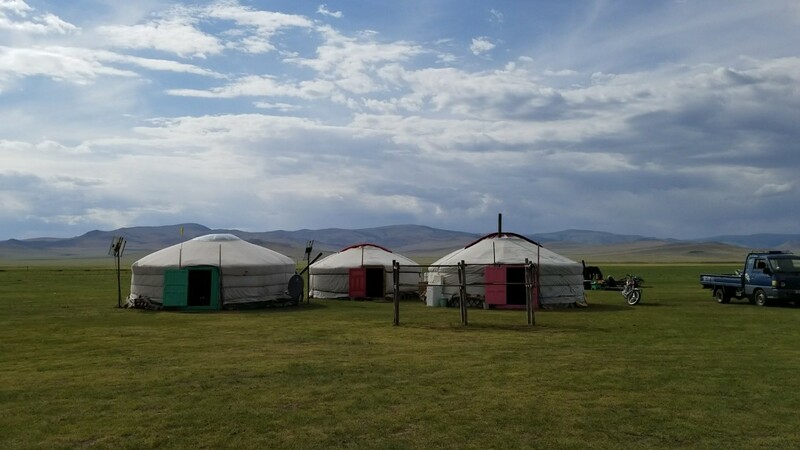 I am excited to see how this statement evolves as this project grows to include the ideas and efforts of endless collaborators in Mongolia and around the world. We face daunting environmental and societal challenges, but together we have the tools to create a positive future.